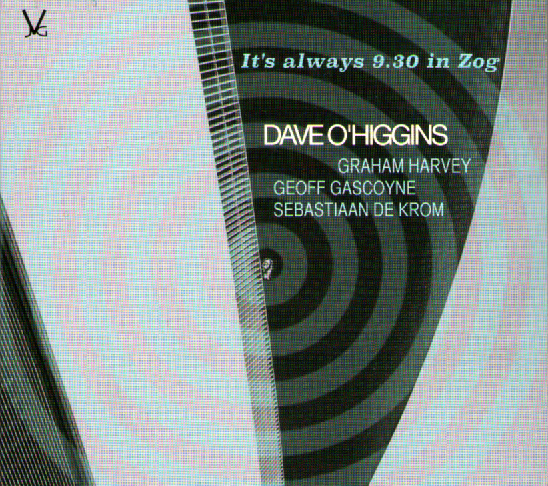 Recorded for a BBC Radio 2 Jazz Club broadcast that was aired on August 11, 1974, this limited edition vinyl release features, major British jazz soloists such as Ronnie Ross, Chris Pyne and Dankworth drummer, Harold Fisher alongside some A-list session men of the time. 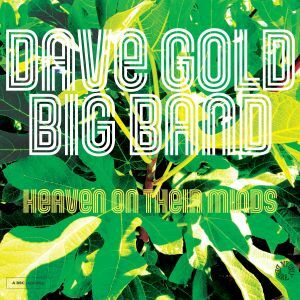 MD Gold, son of the legendary Harry Gold (of Pieces of Eight fame), arranged all four tracks and composed two of them. He retains many of the big band conventions whilst incorporating the funk/rock rhythms that were becoming so much a part of the jazz scene at the time and which, indeed, have stayed with us in one form or another ever since. To draw a parallel, the Woody Herman Band on their Light my Fire album were working the same side of the street. 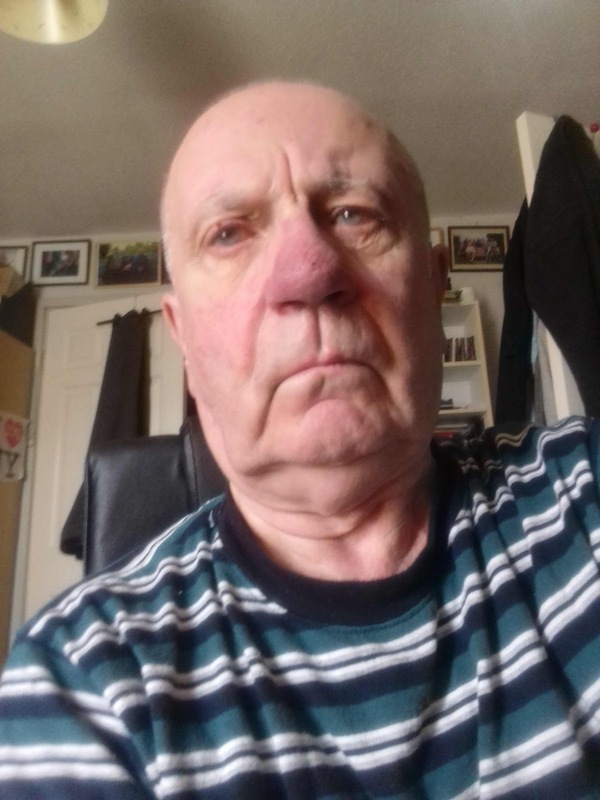 As some of our readers may know, I'm currently hors de combat (hence the unsmiling photo), and as such unable to get around the local gig scene. This places an increasing burden upon the shoulders of Russell and our other reviewers so, to alleviate their workload, anyone at a gig where there is no obvious reviewer present who would like to pen a few words are welcome to do so. You don't have to be A level English, in fact probably better if you're not! Just jot down your thoughts and observations (preferably with a photo of the gig) and mail them to lanceliddle@gmail.com. The guide lines are simple. Times New Roman - 12pt. Song titles in italics rather than inverted commas. Let's be hearing from you. 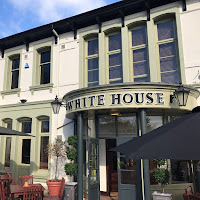 The MDA Music Scholarship proudly presents an evening of jazz at the White House, Wooler Rd., Hartlepool TS26 0DR.. 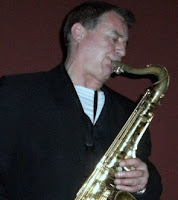 It features the fantastic Mick Donnelly Quartet, James Harrison on piano, Mick Shoulder on bass and Tom Chapman on drums, plus guest musicians from the MDA of music. It is a FREE event, however, we will be fundraising for the Scholarship Fund. This coming Thursday (August 3 - 8pm kick off). An event worth supporting by anyone interested in nurturing the next generation of jazz musicians. Peter Jones (vocal); Vasilis Xenopoulos (tenor/flute); Anthony Kerr (vibes); Neil Angilley (piano); Andy Hamill (bass/harmonica); Davide Giannimi (drums). 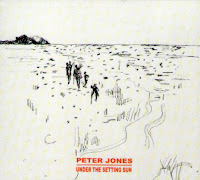 Peter Jones wears many hats, not least as an occasional contributor to these pages. 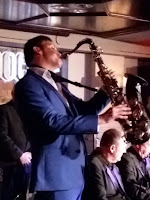 His reviews from various London gigs help to make our presence known in the capital. He's also the author of what promises to be the definitive biography of Mark Murphy (out April 2018)* and, as this album shows, a first class singer/composer/lyricist. Oh and, by the way, in case anyone thinks this review is of the 'jobs for the boys' variety we enthused over his previous album** long before we knew him! Island Honey, set to an infectious cha-cha beat, the number was inspired by a small island off Brazil where he once holidayed. I'm not sure if the honey is a local lady or a reference to the luscious flute solo by that Greek God - Vasy. The second of four engagements in her native north east for London based Jo Harrop. 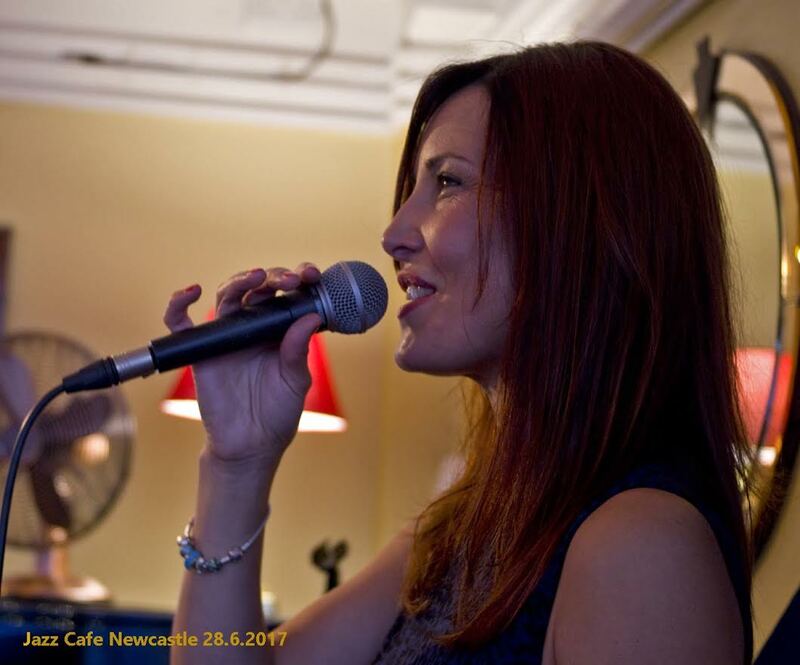 Newcastle’s Jazz Café reunited vocalist Harrop with pianist Paul Edis for a duo performance of classic material ranging from Ellington to Gershwin, Legrand to Mancini. 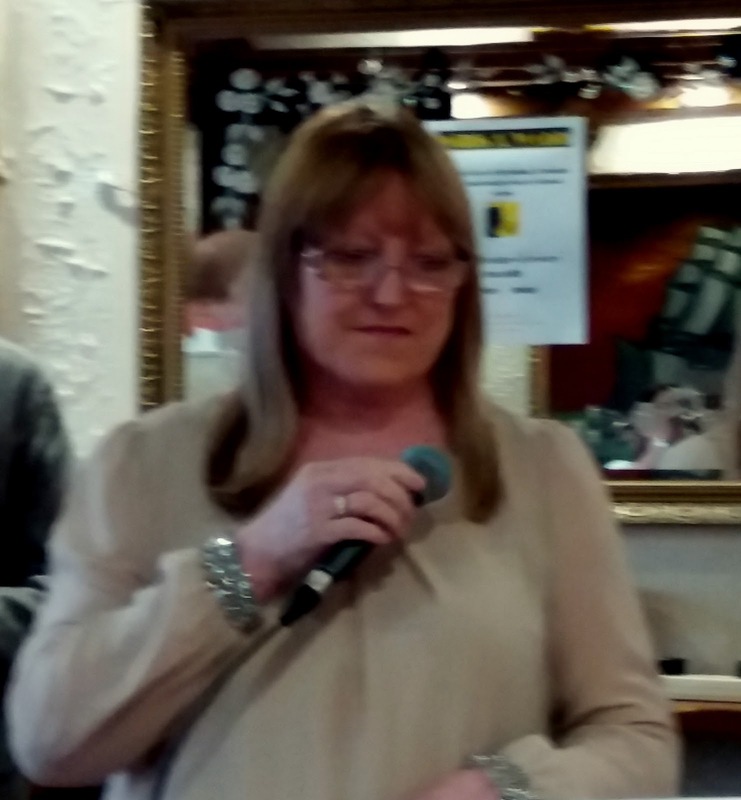 Four gigs in a whirlwind three days (two in Newcastle, one in Durham and a first appearance at Ushaw) working with some of the region’s top flight musicians enabled Ms Harrop to reunite with family and friends making for an extended social occasion. 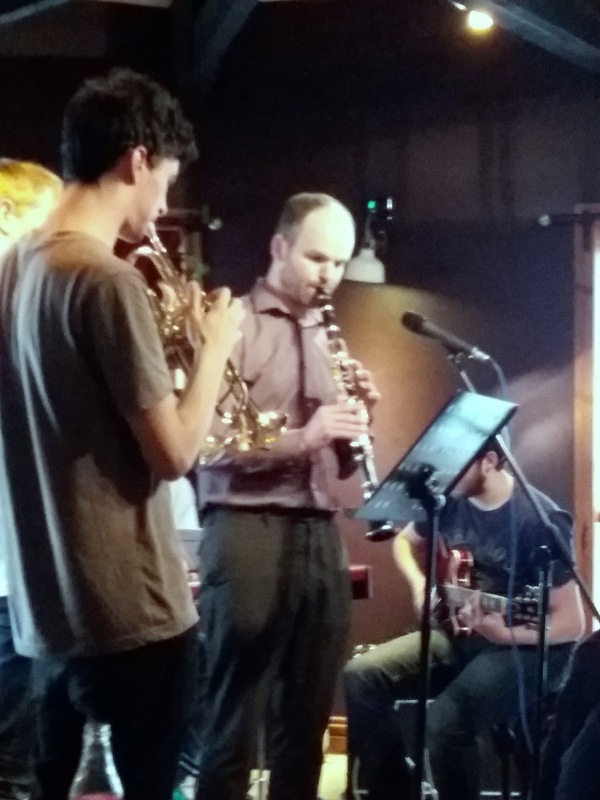 Jazz North East's end-of-the-month Schmazz concert (and the end of JNE's Summer season too) concluded with a performance from another young, vibrant group of musicians with the focus again entirely on their own original material. 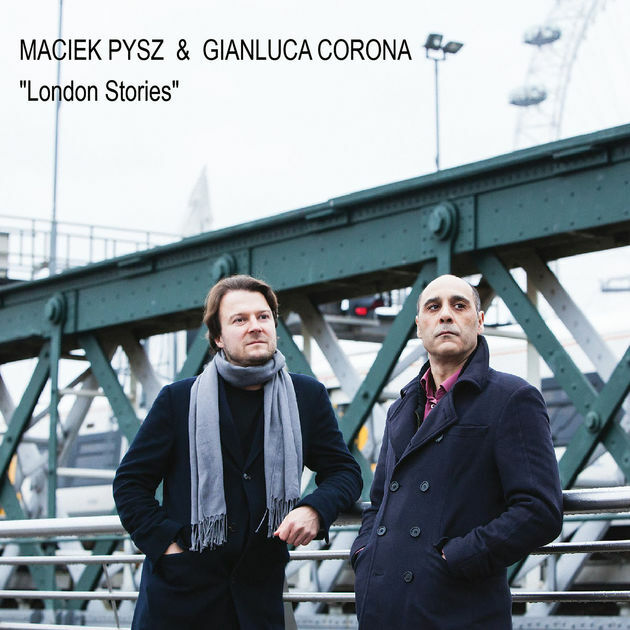 A London based sextet led by double bassist and composer Misha Mullov-Abbado, son of Russian classical violinist Viktoria Mullova and the late Italian conductor Claudio Abbado (who’s own father was a violinist). Yet despite his distinguished classical upbringing, Mullov-Abbado chose to pursue a career in jazz and, in 2014, he became a winner of the Kenny Wheeler Music Prize (he also picked up a Dankworth Prize for jazz composition). To date, MM-A has released 2 CDs (the first with a little help from his Mum on one track). Monday night, the only game in town is at the Prohibition Bar in Gateshead and it's a BIG ONE! 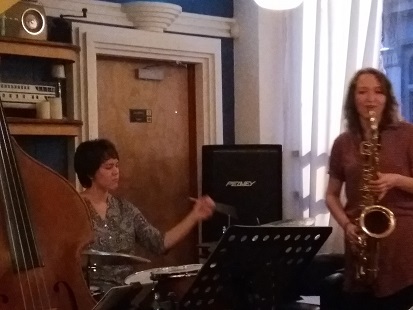 Julija Jacenaite, Lithuania's gift to the world of jazz, appears at the railway arch speakeasy as part of her quartet. JJ has been causing a sensation in recent weeks at the local jam sessions and the question everyone is asking is "When can we see her on a gig?" Well, the wait is over. 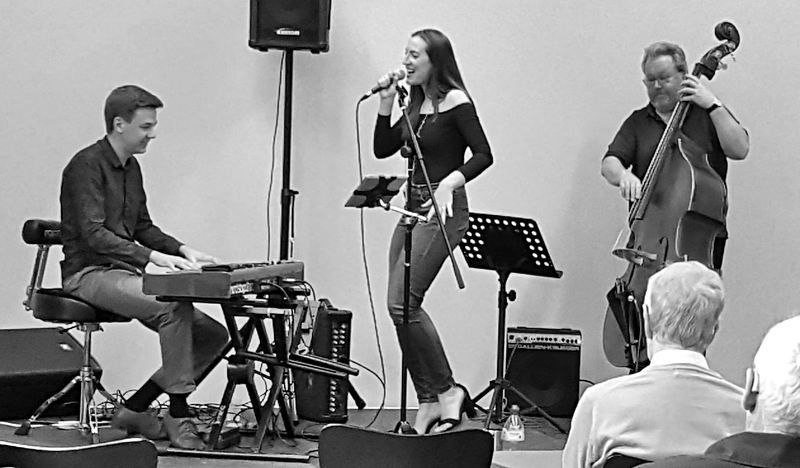 Monday, July 31 at the Prohibition Bar, Arch 3, Brandling St., Gateshead NE8 2BA sees Julija socking it to them alongside Joel Brown (keys); Paul Grainger (bass) and Matt MacKellar (drums). 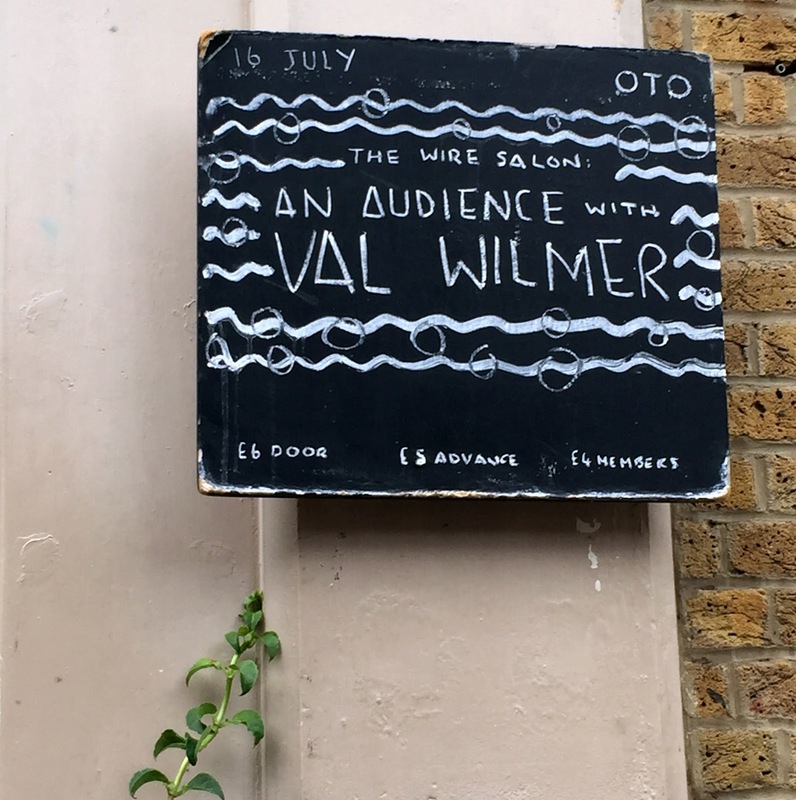 I'm not sure what time the show starts but the doors open at 7pm which, as it's a compact venue, might be a good time to get there so you can grab a seat. And it's free! Although donations will be welcomed and, after you've heard her, you certainly won't begrudge whatever you can afford. And it doesn't end there either. That jazz is an international language has rarely been more personified than in this Polish/Italian meeting of like minds. Two masters of the art of unamplified playing, feeding off each other to transform a duo into a single entity. Musical Siamese twins if you like. Pysz, who created such a wave of enthusiasm when he played at the Globe a couple of years back, fluctuates between classical and acoustic guitar whilst Corona plays classical throughout. The generosity of the North East Jazz community (both in terms of spirit and resources) has been well known to your correspondent for several years. Such generosity manifests in the warm welcomes given both to those wish to make music and to those (like myself) who sit and listen; in the gracious way in which the seasoned veterans give way to jam session sitters-in; in the encouragement given throughout the community to the next generation of jazz musicians; in the thoughtful tributes paid to those who have completed their journey; and in the willingness to contribute financially and in kind to the greater good. 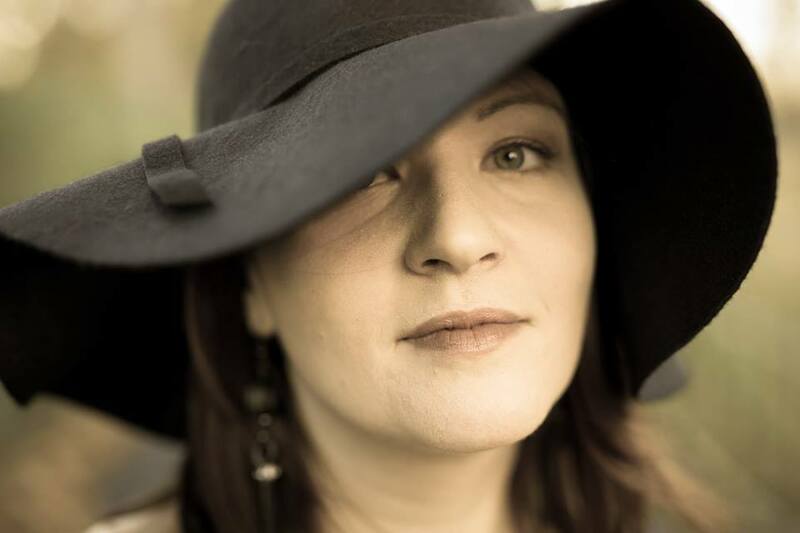 Ms Bell, an Australian woman who lives in Athens, is an award-winning author, poet, creative writing teacher, graphic designer, singer, songwriter, and musician. She also co-founded Vine Leaves Press and she writes for various language teaching publishers. She is the daughter of Erika Bach, who with her partner Demetri Vlass, founded two of Melbourne’s iconic indie bands, Ape The Cry and Hard Candy. Continuing its commitment to providing a worldwide audience the opportunity to experience world class jazz and exclusive shows through its programme of live video streaming, Ronnie Scott’s will live-stream the final night of The Bad Plus this Thursday. The Bad Plus bend the rules in their own way, drawing on classical, rock and jazz to create their own febrile sound that is as invigorating now as it was when they released their eponymous debut album in 2001. Wendy Kirkland (piano/vocals); Pat Sprakes (guitar); Paul Jefferies (bass); Steve Smith (drums) + Gary Grace (vocal on 1 track). 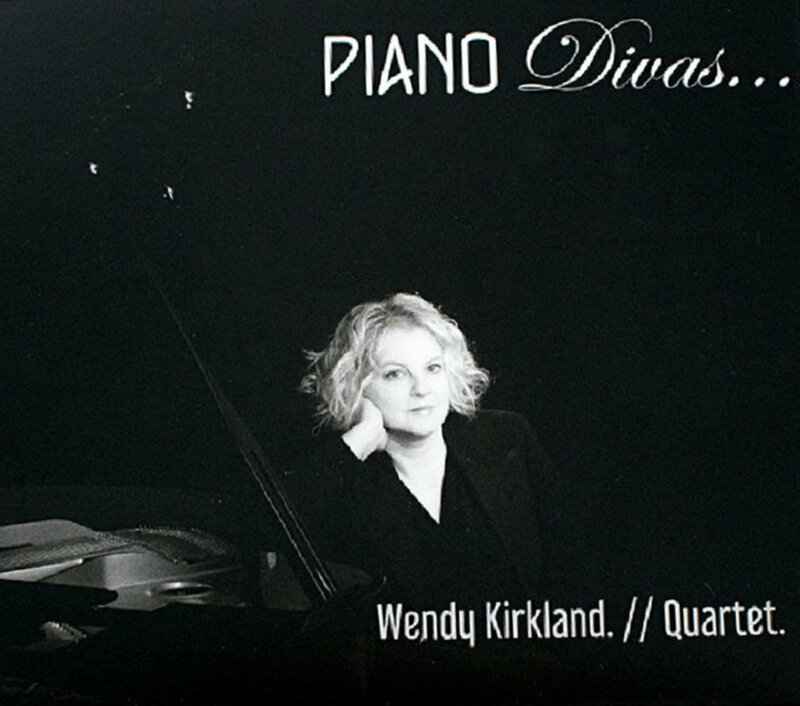 Pianist/singer Kirkland and her henchmen came up with the idea of putting together a show based on the work of the various great pianist/singers such as Krall, Simone, Blossom, Horn, Elias and others. In the years to come, some other pianist may repeat the exercise the only difference being that whoever does it will have added Wendy Kirkland to the list - she's that good! The Chesterfield - two CDs in a row from the Peak District! Must be something in the Derbyshire air! * - chanteuse opens with Come Dance With Me. From bar one I sensed that this lady was something special and when I heard the piano solo my suspicions were confirmed. At the Jazz Band Ball by Muggsy Spanier and Intermission Riff by Stan Kenton hit me simultaneously which was all wrong. Back then it had to be either one or the other. If you liked Dixieland then you turned your nose up at Progressive Jazz and vice versa. Likewise, if you went for the Bunk Johnson/George Lewis brand of New Orleans it was heresy to even mention Bird or Diz in the same breath. Today there are still pragmatists in both camps who maintain this tunnelled vison approach. Birth of the Blues by Frank Sinatra. One of his last recordings for Columbia before moving over to Capital and those classic long-players: Wee Small Hours, Swingin’ Lovers, Swingin’ Affair etc. Birth of the Blues was important inasmuch as it removed Guy Mitchell, Eddie Fisher, Johnny Ray from my record shelves. The B (flip) side, Why Try to Change me Now?, remains the benchmark for ballad singing. Warren at the decks mixing bass-heavy soul grooves with chart-topping soul 45s, cocktail mixing at the bar, the Hoochie Coochie vibe was lazy Sunday afternoon. The Ambassadors of Swing were in the house, primed, pumped and ready to go. Mr Isaacs’ fan club occupied booths and precious few bar stools, many dressed to look good on the dance floor. Dressed in black the Ambassadors of Swing took to the stage. These guys have played everything, played everywhere, and performed with anyone who is, or was, somebody. When they get down to business they are just that… ’the business’. To the opening of Wonderwall Jason Isaacs strolled out to a hero’s welcome. Sharp suit, Vegas Strip polished shoes, Jason Isaacs’ whirlwind performance is a masterpiece in choreography allied to the tightest of bands taking its cue from MD Darren Irwin as the main man charms his audience. Welcome to the Church of Music says Isaacs. The Hoochie Coochie congregation cheers as the band goes into Beyond the Sea. Isaacs’ show is non-stop, it’s a revue combining jazz and pop standards – meat and drink to the Ambassadors of Swing – with a few of Elvis’ hits. 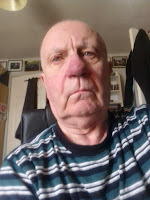 As Bebop Spoken Here is a jazz blog, one mention of the bloke last seen down at the chip shop is mention enough. A sad night at the Sluice. A continuing low turnout (in the low 20s) has forced Herbie to call it day for this long running monthly gig. The low turnout did not phase the band and they got a standing ovation at the end. Two fantastic one-hour sets. Jim McBriarty and Bob Wade did the two Clarinet thing With Creole Love Call, ably supported by Herbie Hudson on harmonica. See attached photo. Smashing arrangement, each musician having a great empathy for the others. Overall, this band just gets better and better. Another mega treat coming for ye Geordie lads and lasses. Two of Teesside's finest coming up, to show you how it should be done. The real thing is unimaginably better than what my camera can capture. Get yeself there bonnie lads and lasses. New to Live Music on Teesside? Send your email to go on my early notification list. William Bell and the state of soul music. The SummerTyne Americana Festival, Sage Gateshead, July 22. 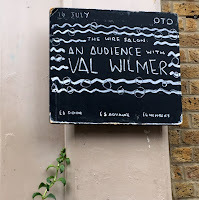 Without checking, this was much the same set as I reviewed at the Barbican last November. 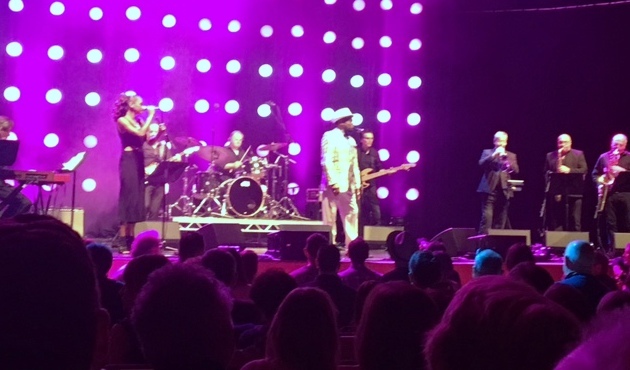 While that was at the London Jazz Festival, under the umbrella of Black Music, this was the SummerTyne Americana Festival, under the umbrella of American Roots Music, reflecting the changing times. I'm old enough to remember the time when most people agreed with Muddy Waters, that the blues had a baby and called it rock and roll. Nowadays rockabilly is considered the most prominent strand of rock and roll and came from country and western. Soul music emerged primarily from blues and gospel, but more recently the country element has become greatly exaggerated with the discovery, by the BBC, Mojo and writers like Guralnick, that many of the musicians, songwriters and producers were southern whites, even though virtually all of the artists, including all of the greats were black. 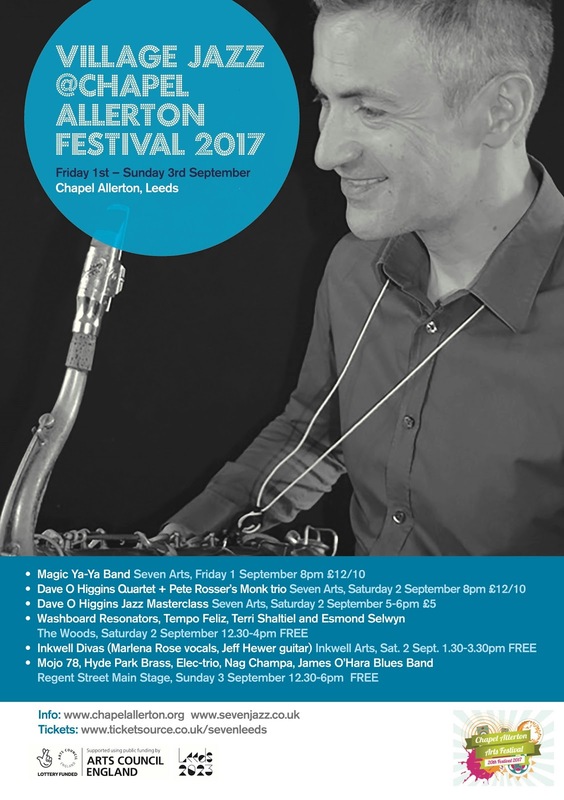 Holly Thackery of Seven Jazz has asked me to spread the word regarding a couple of jazz festivals coming up in Leeds in the near future. Now, whilst describing them as festivals might be stretching things a little bit there does appear to be enough happening to attract Snake Davis' multitude of fans to Leeds and Dave O'Higgins' devotees to Chapel Allerton. Plus, there are quite a few freebie events that look very appealing. Open Letter to Mingus is one and Slide Area another. There are also workshops, bluesmen and maybe, just maybe the sun will shine! 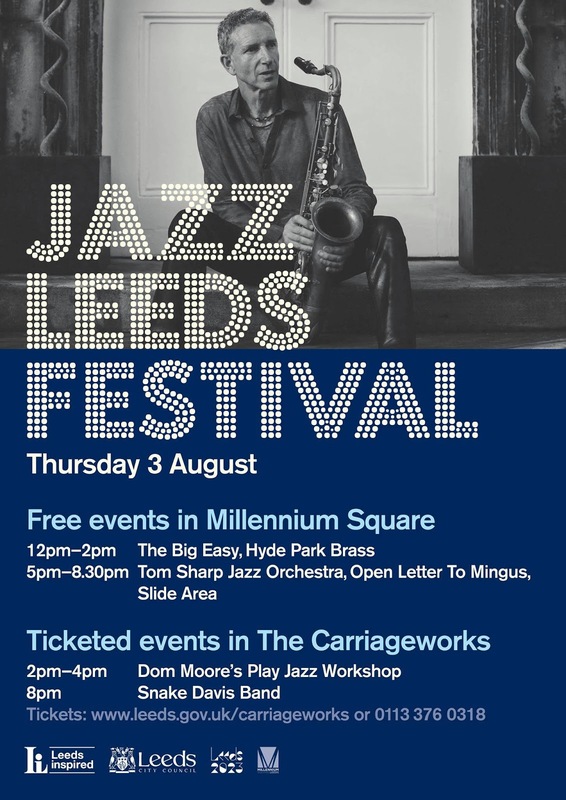 For further details click on the posters or visit: Seven Jazz's Jazz Leeds Festival and Chapel Allerton's Village Jazz Festival. 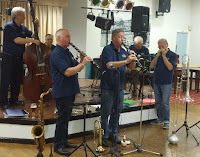 Chris Barber (Trombone, Vocals); Bob Hunt (Trombone, Trumpet); Mike Henry (Trumpet, Cornet); Peter Rudeforth (Trumpet); Nick White, Trevor Whiting (Saxophones); Bert Brandsma (Clarinet, Tenor Sax); Joe Farler (Banjo, Guitar); Jackie Flavelle (Bass, Bass Guitar); John Watson (Drums). From New Orleans styles to Duke Ellington, last night, The Chris Barber Band played with tremendous skill and presentation at the Playhouse in Alnwick. 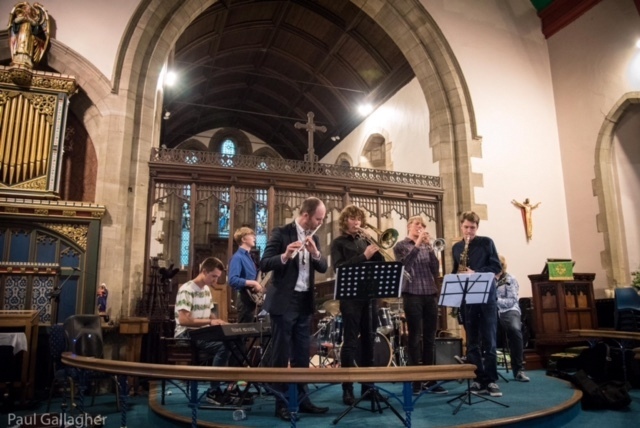 We were treated to classics such as Bourbon Street Parade, A really beautiful rendition of Petite Fleur, by Nick White and a fantastic presentation of The Saints by the whole band. Many more favourites gave a privileged audience a truly memorable evening. 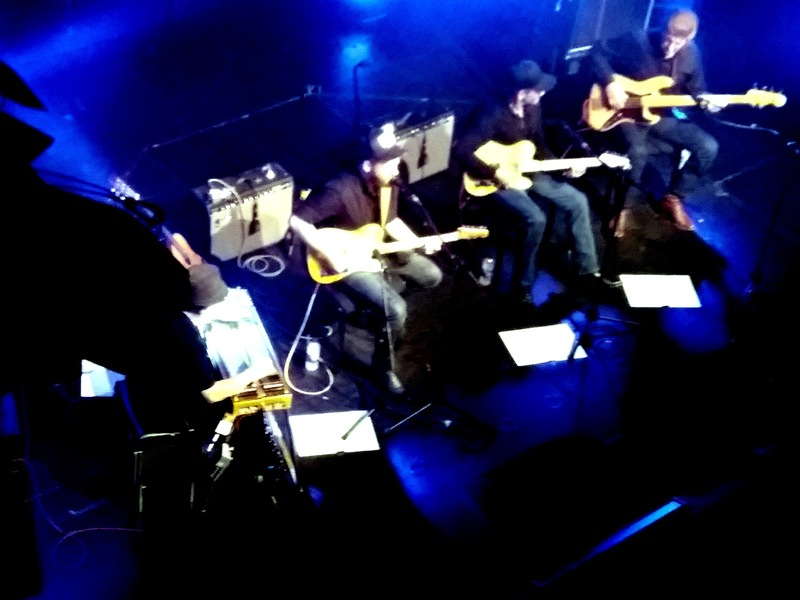 Ben Haggard (guitar, vocals); Noel Haggard (guitar, vocals); Norm Hamlet (pedal steel); Eddie Curtis (bass guitar). This band went down well to a full capacity Sage Two. None of the songs were announced because I guess, most of the audience knew the material. The musicians played the instruments well, with occasional short solos during songs, probably improvised, and the singing was good. The audience joined in occasionally with a few lines of songs, and some clapping. The mood was one of easy, relaxed listening. Ben and Noel are the sons of the late Merle Haggard, who died last year aged 79. The sons paid tribute to their father during the show. So why wasn’t I quite happy and at ease, like the rest of the listeners? I’m not the best person to be reviewing a band such as this one, as I don’t especially like the content of the songs presented. This is what I call ‘cowboy’ music, and I don’t mean that description as an insult, but simply as a description. The lyrics portray a kind of freewheeling ‘cowboy’ feel, which I suspect never actually existed in real life. Alice Grace Trio @ Bishop Auckland Town Hall - July 21. Alice Grace (voice); James Harrison (keys/accordion); Paul Grainger (bass). It's been said countless Tymes that [Ooh ooh ooh] Ms Grace is the satin of the human race, and Bishop Auckland was in for a real treat this lunchtime. Work and family commitments meant that I've missed the last couple of gigs here but roving eyes and ears Tony Eales, says it's currently touching the twenty mark, which is getting there but, when you look around at the lit up faces, you wish you could get to the rest, you just know they would love it if they only knew about it. (Editor: Perhaps BSH should hire a light aircraft and do a propaganda leaflet drop over Bishop. Council funded of course). Alice has a beautiful, clear, voice, comfortable across her significant range, including the high notes; she does some Sassy Jazz and is a mistress of the art of scatting. If it’s summertime it must be SummerTyne. Sage Gateshead’s biggest festival of the year opened for business at noon on Friday (July 21st) on the Jumpin’ Hot Club’s Performance Square outdoor stage. Street food stands (including Wylam Brewery) did a roaring trade all day long, the rain held off (more or less), and inside, Sage Gateshead’s concourse couldn’t have been more crowded. A private reception for some in the bar located outside Sage Two, the masses sought vantage points to enjoy the Stax Academy Revue’s opening set at six thirty. 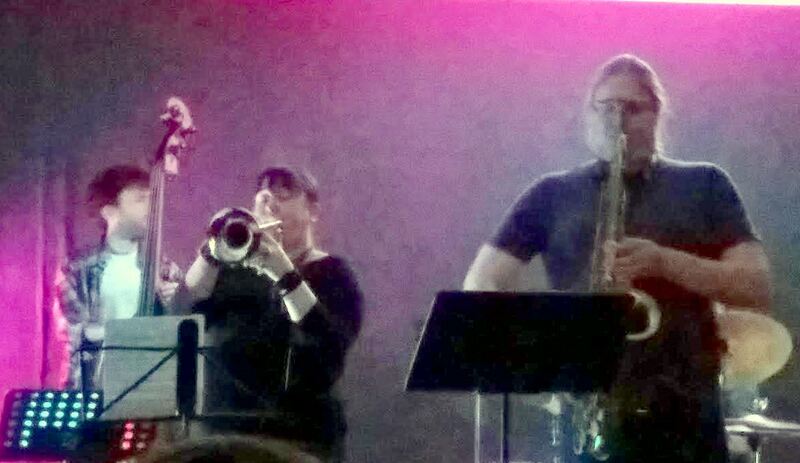 William Bell’s band (minus the man!) played at ear-splitting volume and there was no escape from it other than to step outside. I’ve Got the World on a String, and so she had. This packed house at the Lit and Phil rolled up to hear the GAS book interpreted by one of its great interpreters. Ruth Lambert arrived in good time, time enough to sit at the piano to play and sing for her own amusement. 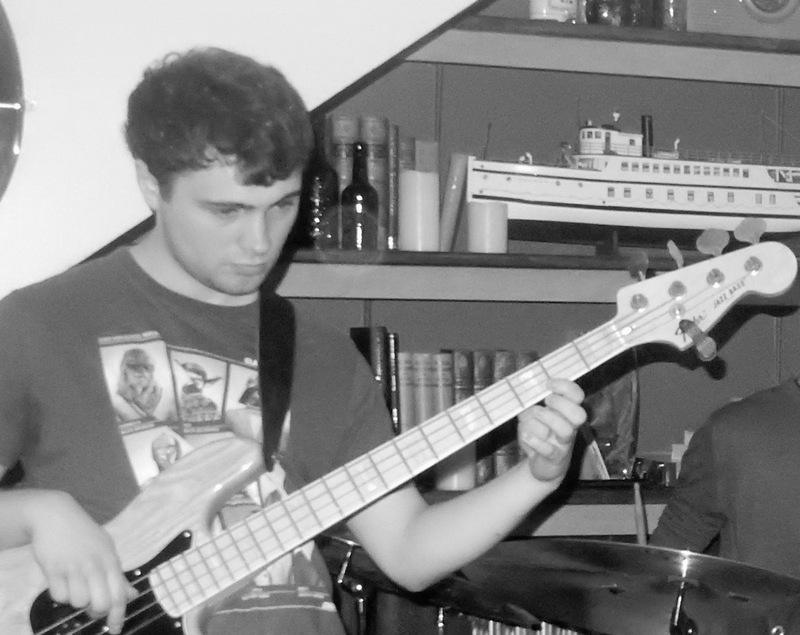 The band arrived in due course; first Guildhall student bassist Michael Dunlop. A first meeting between the pair, Dunlop a dep recommendation by Lambert’s peers. Drummer Russ Morgan parked outside to off load then drove off to find a parking meter. Pianist Dean Stockdale strolled in. The quartet got into a huddle to agree on a programme as the audience took its many seats in the Loftus Room. 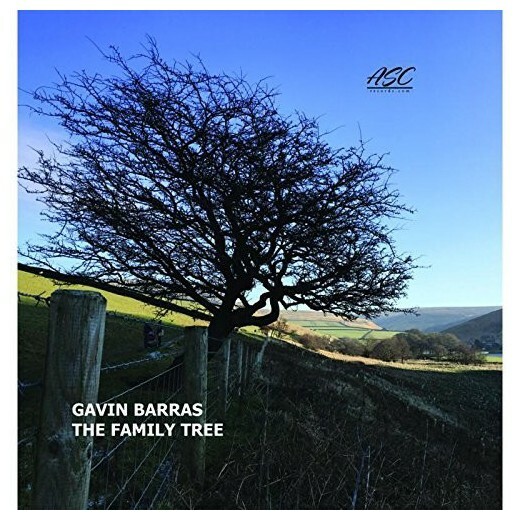 Gavin Barras (double bass); Jeff Guntren (tenor); Jim Faulkner (guitar); Dave Walsh (drums) + (on 2 tracks) Gavin Barras (acoustic guitar); Rhiannon James (viola); Margit van der Zwan (cello). 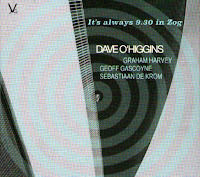 “Best known for his work with trumpeter Matthew Halsall” says the blurb. And it’s true. Barras has appeared with Halsall in the locality [NE UK] over recent years. 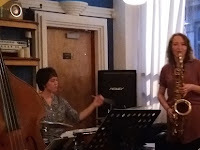 However, the bassist/composer’s most recent visit was as part of the Dean Stockdale Trio with whom he excelled. He excels here too performing his own compositions all of which have family connections in one form or another. 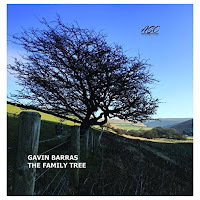 Perhaps the strongest family connection is the instrument Barras is playing – a double bass crafted by his father, luthier Steve Barras. Not surprisingly, the album is dedicated to Steve. Bassist and occasional contributor to these pages, David Brownlow, has been thinking back to some of the key jazz moments that impacted on him over the years both as a listener and a player. 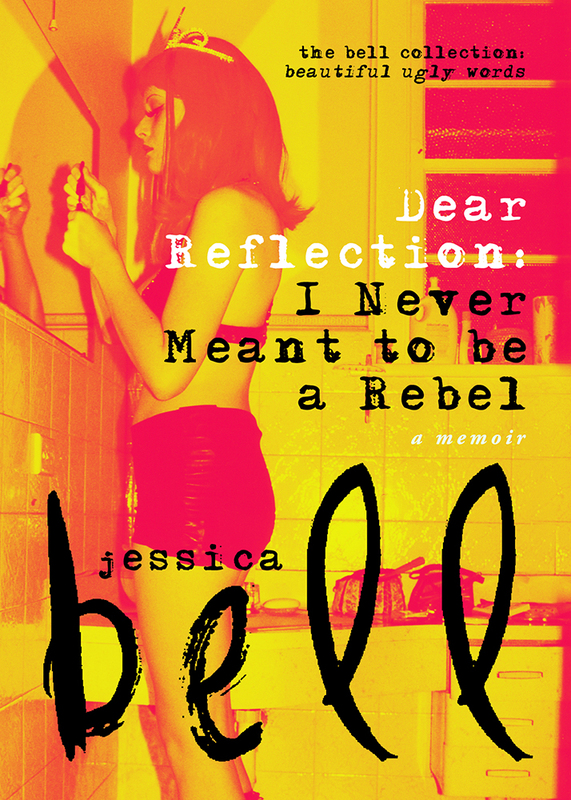 He mentions some of them here and hopes that other readers will follow suit with their thoughts. 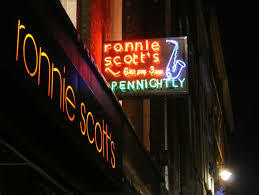 The 60s to the Noughties saw many visiting stars in concert - Diz, Stitt, Hawk, Eldridge, Peterson, Ray Brown, Kessel, Brubeck, MJQ, Ellington, Hi-Los, Ella, Gil Evans, Miles, Trane, Dolphy, Elvin Jones, Ronnie Scott, Stan Tracey, Mick Mulligan/George Melly, Keith Jarrett & 'Standards Trio' and others not-quite so memorable ! 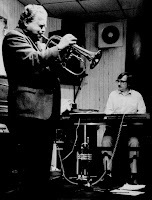 Circa 1970s Met Red Rodney [pictured left with Bill Harper] at the Corner House. Rodney played with Bird !! 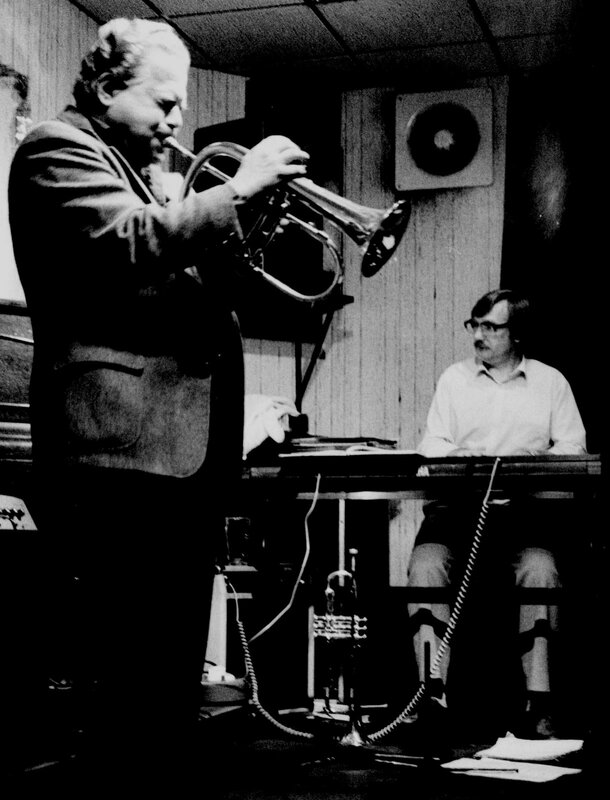 Val Wilmer has given us some of the twentieth century’s most distinctive images of jazz musicians. With a journalistic commitment to the truth of her subjects and an artist’s eye for a memorable picture, her photographs portray the stars of the music as both working players and living people. Since the early 1960s the writer and photographer has interviewed and photographed everyone from Louis Armstrong to Sun Ra in a colourful and fascinating life. A jam session debut for Stuart Collingwood. Been there, done that, has Stuart, so this jam session held no fears. 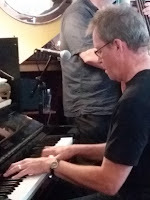 Ain’t Misbehavin’ (true, he wasn’t), A Foggy Day (anything but), Come Rain or Come Shine, proper piano playing, likewise bass and drums courtesy of Paul Grainger and Russ Morgan. The evening’s ‘guests’ as Collingwood called them – the sitters-in – were rather thin on the ground, at least initially. One such sitter-in who clocked-on early was Newton Aycliffe-based drummer Abbie Finn. On hearing the news that Ms Finn was in the house, one of the house rhythm section said: Oh, good! Finn played a few numbers, stood down, to return later. First Russ Morgan then Abbie Finn, a frighteningly high standard had been set. A glance around the room…Where had all this lot come from? Suddenly a thinly populated Jazz Café was now heaving. Why settle for two fabulous drummers when you can have four? The Matts had arrived. Kathryn Tickell and Superfolkus @ Lindisfarne Village Hall – July 16. Kathryn Tickell (Northumberland pipes, fiddle), Sophie (fiddle, guitar), Scott (guitar, piano, mandolin), Michael (accordion), Will (percussion, mandolin). Guests: Abby, Mike Tickell (voice), Rory (piano). When the tide comes in Holy Island is another country, they do things different there. One lady told us that the pubs stay open late in summer but close early in the middle of July. I hoped the Wicker Man would be on the box to really spook Mrs T. Whether summer or mid-July, headline acts play in the afternoon so the queer folk who cross the causeway don't get stuck. 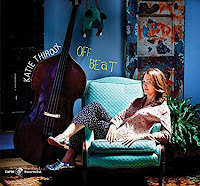 Bebop Spoken Here is a North East Jazz site and many will claim Ms. Tickell has nothing to do with Jazz and I wouldn't totally disagree, despite her exploratory nature, her experimenting with unusual (for folk) instruments, room for improvisation in the frequent jigs and no small amount of virtuosity. 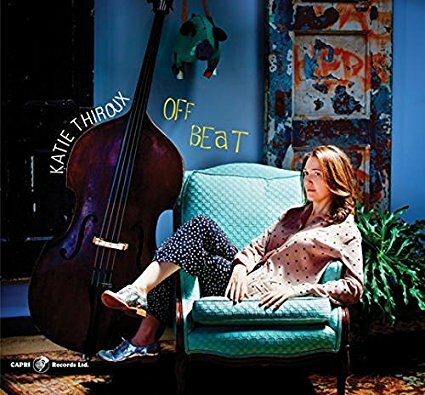 She has also written, recorded and performed with British jazz sax ace Andy Sheppard which remains in her set, whether Superfolkus or the Side. 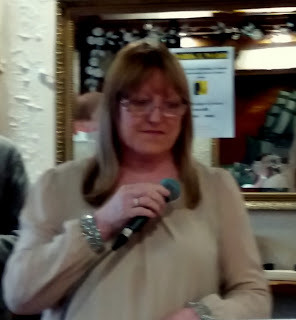 Ruth Lambert's lunchtime gig on Friday at the Lit and Phil will feature a couple of deps. 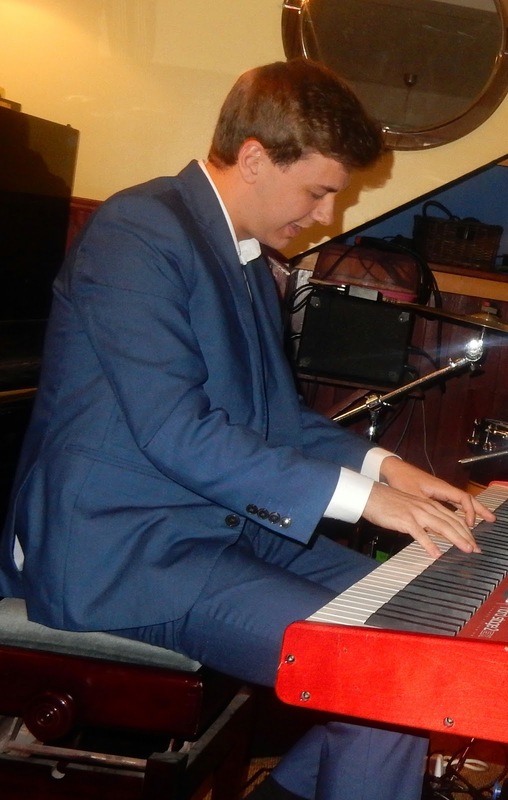 Top class pianist Dean Stockdale steps in, replacing guitarist Mark Williams, and former Jambone bassist Michael Dunlop, currently studying at the Guildhall, will be in town to work with Ms Lambert. It's a one o'clock start, £5.00 on the door. Arrive early, it's sure to be busy. Stockdale photo courtesy of Ken Drew/ Dunlop photo from archives. This Young Musicians’ Programme concert, the second of two performances, presented the music of Duke Ellington’s Sacred Concerts in Sage One, Sage Gateshead’s magnificent, 1700 seats, state of the art concert hall. The project had been long in the making with frequent rehearsals over many months. 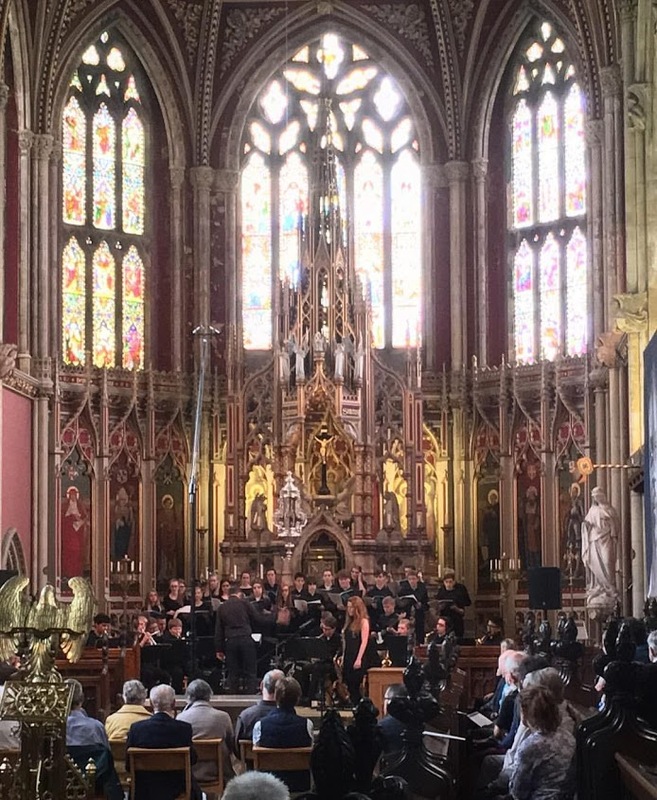 A successful first performance took place on Saturday afternoon at Ushaw, Durham (photo by Kate Edis), in the splendour of the former seminary’s chapel, and this Sunday evening concert concluded a weekend of music making under the aegis of the Young Musicians’ Programme (YMP). Paul Edis and Matt Beckingham tutored respectively Jambone and Quay Voices (Jambone is Sage Gateshead’s youth jazz orchestra, Quay Voices the youth choir) throughout the 2016-17 academic year, culminating in this weekend of memorable public performances. 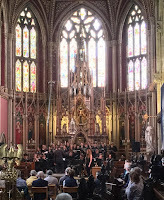 Featured guests worked with Edis and Beckingham throughout the year and their participation in the project should, perhaps, be viewed as a contribution of equal, rather than superior, value to orchestra and choir. A Zez Confrey tune to open proceedings; Stumbling written in 1922 (with thanks to Steve Andrews’ encyclopedic knowledge of the composers and musicians of the era!). 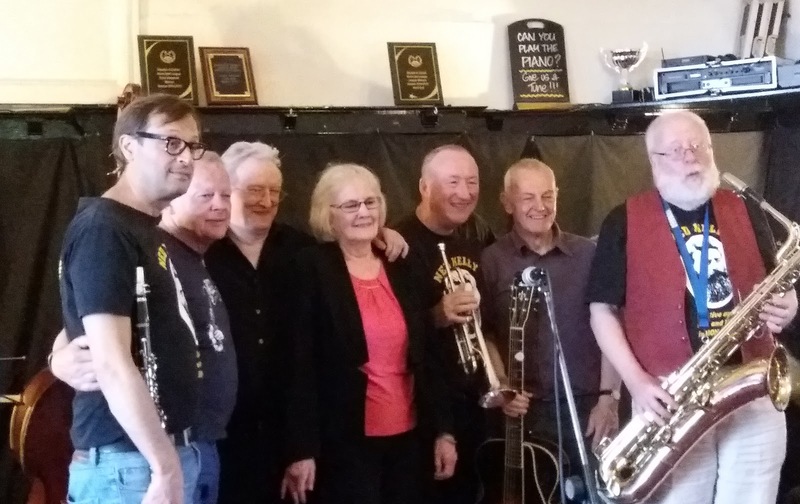 This Blaydon Jazz Club gig, at the Black Bull as usual, was something of a departure in being a first ever lunchtime promotion. 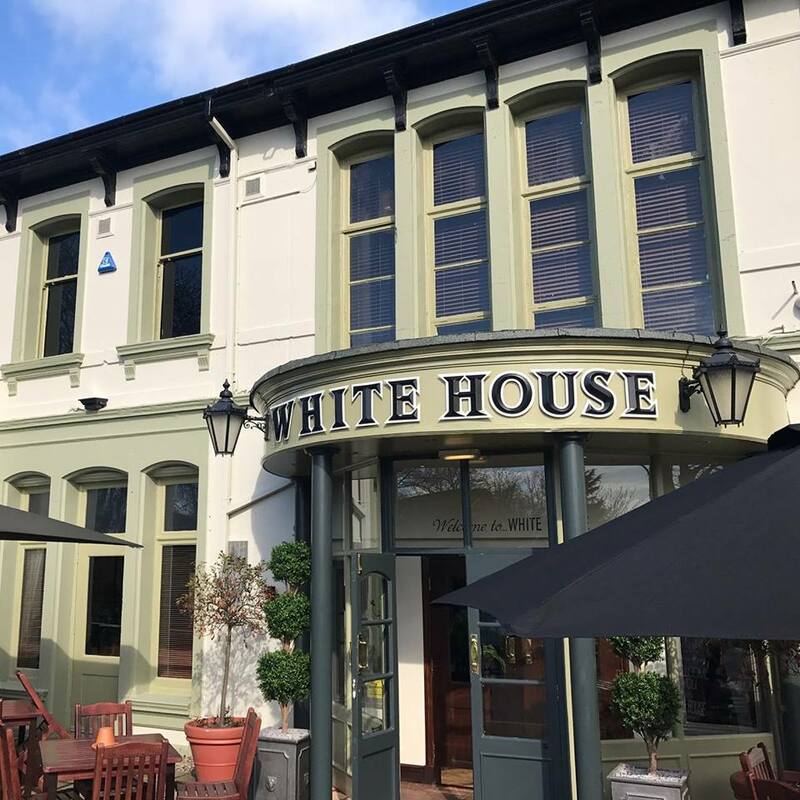 The unavailability of the room on the preferred Sunday evening necessitated the change, and fears of a low turn out were soon allayed as regulars rolled up bolstered by a large contingent from Hong Kong. 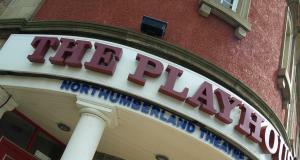 I’d finally made it to this gig which takes place quite near to my home in South Shields and I wasn’t disappointed. And there was the added bonus of meeting Lance’s friend Colin, over from Hong Kong, who is a BSH legend. 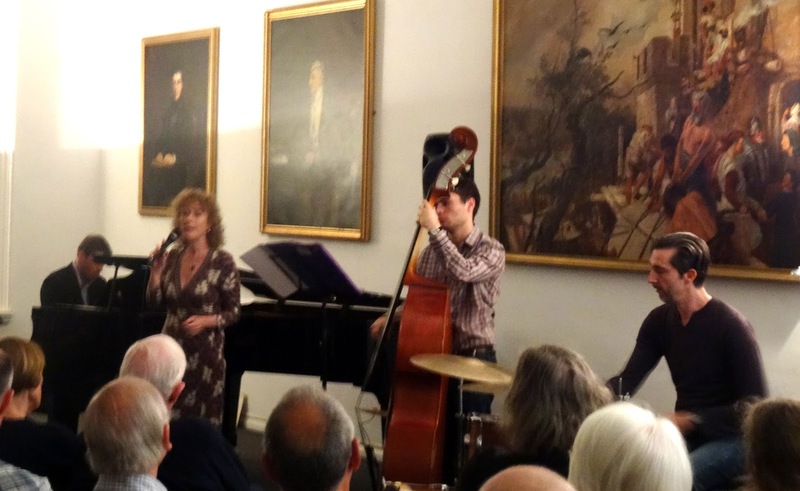 Ms Webb is a very talented and experienced vocalist, Roy Willis was superb on guitar, then there was the added pleasure of a smooth, liquid clarinet, Colin’s rich, lively trumpet and also a song or two from Neville Sarony, (also visiting from the Orient) who has a fine tenor voice. 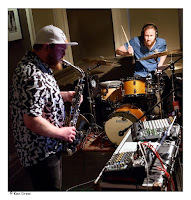 I was a bit puzzled by the use of a backing tape of piano bass and drums, which the band could well do without, as they have enough skill without any assistance, but the tape didn’t detract too much from the enjoyment. "Oh Good, You're still there!" Her voice was well modulated but somewhat breathless with an accent I couldn't place. "Your ad in the phone book says you specialize in missing persons, are you any good at it?" "I'd like to think so. So who's missing and how long have they been gone?" "Me. I mean... I don't know." Most 'Persons' cases start out pretty simple. This didn't seem to be one of them. The day began a little earlier for me, the ongoing search for an amp FDT is wholly happy with and arrangements for a first and last-minute run through for a band who've never played together. In fact, Michael and Joel have never played with each other at all and it continues to amaze me that Jazz musicians, even so young, can do this. 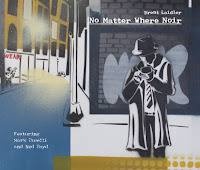 Ben Lawrence has been exploring the possibilities of the classic Fender Rhodes sound, which is exciting for a self-confessed piano trio philistine like me, reared on seventies Jazz-funk when it was so prevalent but, here restricted to the downstairs upright acoustic piano, he gave for me the best performance yet of this combo to watch, his original standing up with a classic and a current big-name American. 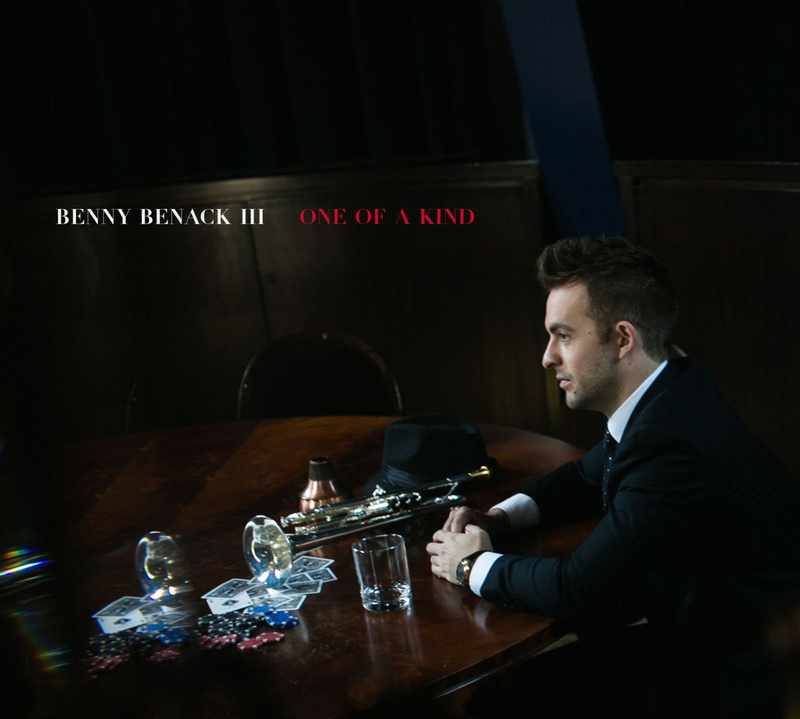 Benny Benack III, a young and multi-talented Pittsburgh native and denizen of the New York jazz scene. He is never one to limit himself. He is both an affable and expressive jazz singer and a formidable, modern-minded trumpeter, and these elements of his musical self are deeply and effortlessly intertwined. 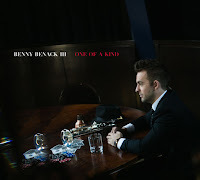 On One of a Kind, his debut release, Benack also reveals himself to be a wry and expressive songwriter and lyricist, bringing his boundless musical gifts together in a program that’s steeped in tradition but every bit as restlessly individual as his album title suggests. At the conclusion of the opening downstairs’ set (see BSH Editor-in-Chief’s review), fed with crisps and sausage rolls and watered (the bottled variety), your correspondent dashed upstairs to catch a set by the Early Bird Band (BSH Editor-in-Chief’s entourage arrived in the their own time). Dr Edis brought along a liquorice stick and took his place alongside the Earlier Birders as they opened with Four. 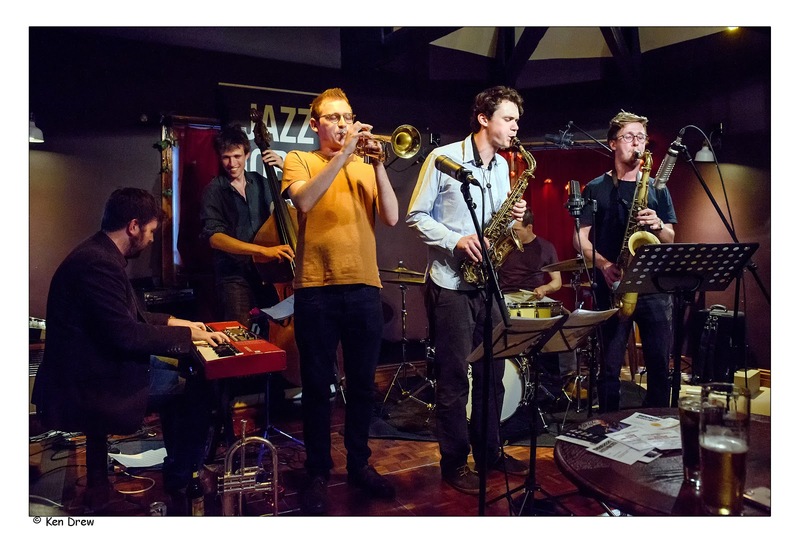 The regular line-up (more or less) made the gig…James Metcalf (trumpet); Ben Lawrence (trumpet); Matthew Downey (guitar); Phillip Grobe (keyboards), Alex Shipsey (bass) & Dylan Thompson (drums). 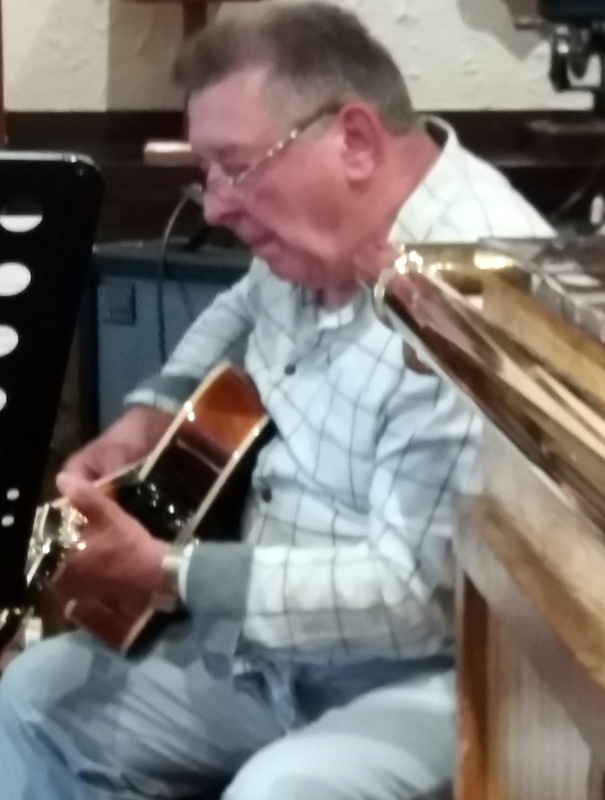 Matthew Downey featured playing his Gibson on Nature Boy and Blues Walk capped a short, sharp set with the young man of the moment – Matthew MacKellar – replacing the impressive Dylan Thompson for one last blast with the Early Bird Band. 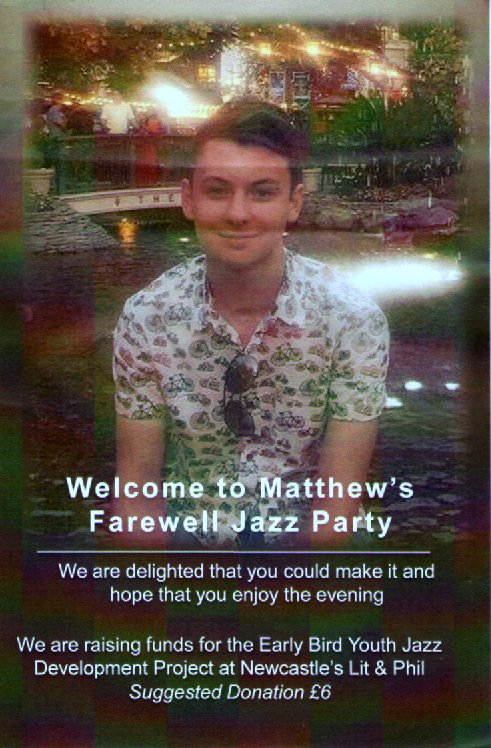 Matthew MacKellar's farewell do was quite a lavish affair with crisps, sausage rolls and other party nibbles adorning the tables plus, naturally, plenty music to sooth the savaged breast. Both floors of the popular Pink Lane bopperie were utilised as friends, family, and the various bands the young drummer has enhanced, wished him well on his voyage into the unknown or, to be more precise, Berklee College of Music. As the happenings were on two levels it was decided that I should cover the lower deck and my worthy constituent Russell the flight deck. 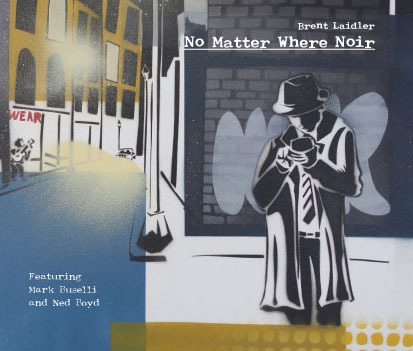 Liane Carroll (vocals/piano); Mark Edwards, Malcolm Edmonstone (piano); Mark James (guitars); Kirk Whalum (sax); Loz Garratt, Roger Carey (bass); Ralph Salmins, Russell Field (drums) Which tracks each musician played on is not stated. Blogmaster Lance handed me this CD for review, casually declaring that I’d have few problems in dealing with it, but he failed to mention that it was a real gem. He gets so many of these CDs, poor lamb. I reckon that the 27 bus should do the next review. But less of this nonsense. 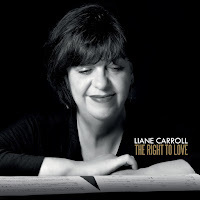 Liane Carroll, a resident of Hastings, is a stellar singer and pianist (classically trained from the age of 3), whose vocals are ‘deeply soulful, wonderfully honest’, as quoted by The Times newspaper. 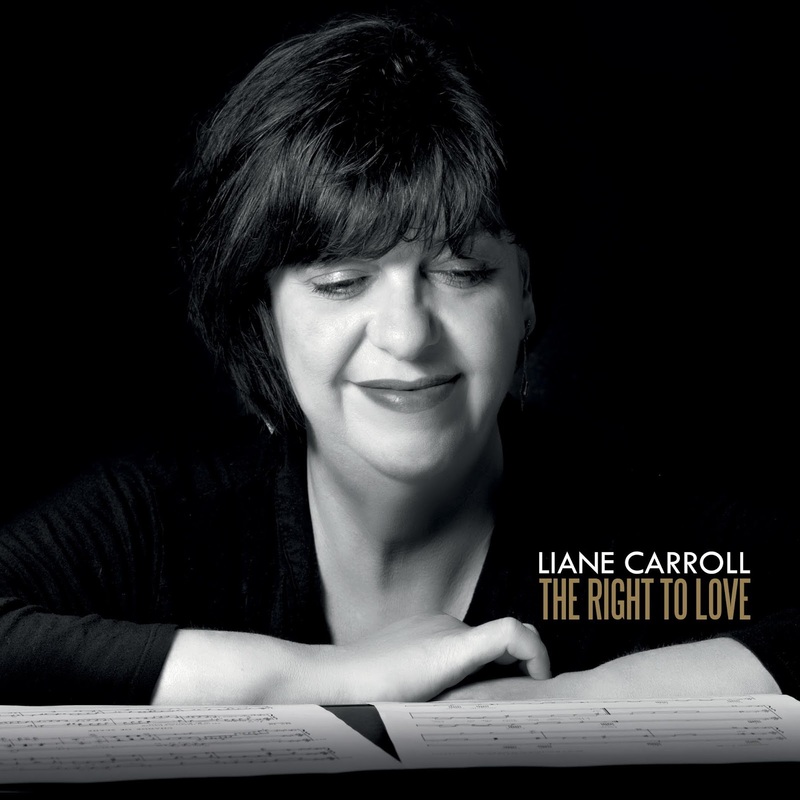 The Right to Love is Ms. Carroll’s tenth CD, and it was produced and recorded by James McMillan in his studio in Hastings. 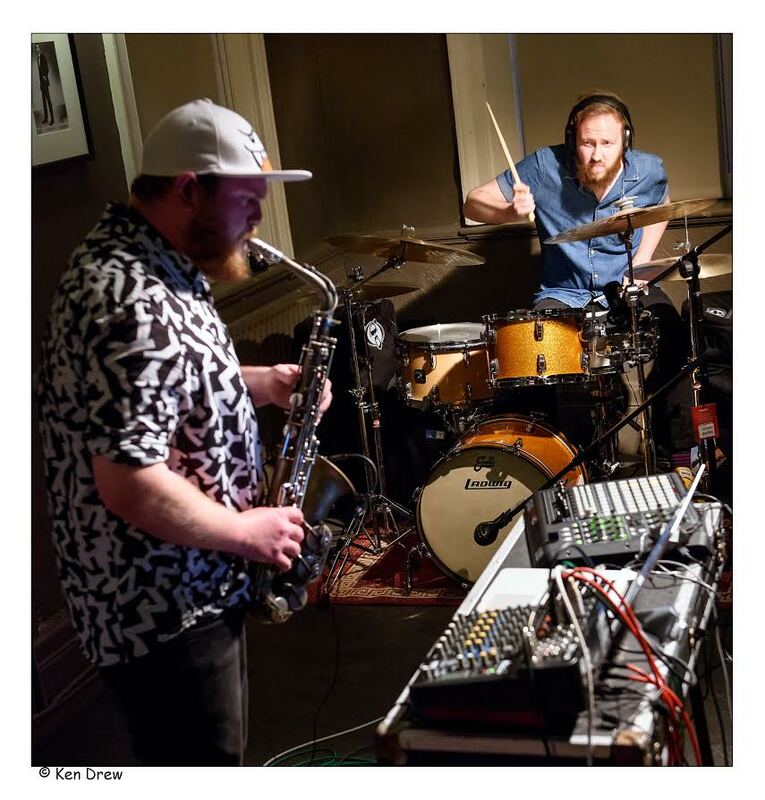 Durham County Youth Big Band to Leeds College of Music to NYJO Academy Big Band to Trinity Laban, drummer Abbie Finn first emerged as a contender at the wonderful Great North Big Band Jazz Festival. A few short years later Abbie has recently graduated from Leeds College of Music with a 1st Class Honours Degree. A teenage award winner at the GNBBJF in Sunderland, Abbie went on to form college bands (gigging on home turf in Darlington, most recently with a quartet at this year’s Darlington Jazz Festival), working with the National Youth Jazz Orchestra’s Academy Big Band, and now, as a graduate, is to embark upon further study at London’s prestigious Trinity Laban. 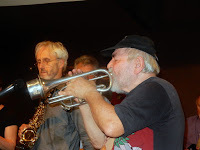 Bob Wade (trumpet); Jim McBriarty (clarinet/tenor/vocal); Laurence McBriarty (trombone); Brian Bennett (banjo/vocal); Ollie Rillands (drums/vocals); Bill Colledge (bass guitar) + Neville Sarony (vocal); Miles Watson (vocal); Colin Aitchison (trumpet/vocal); Franco Valussi (clarinet). (Review by Lance/photo courtesy of Colin Aitchison). 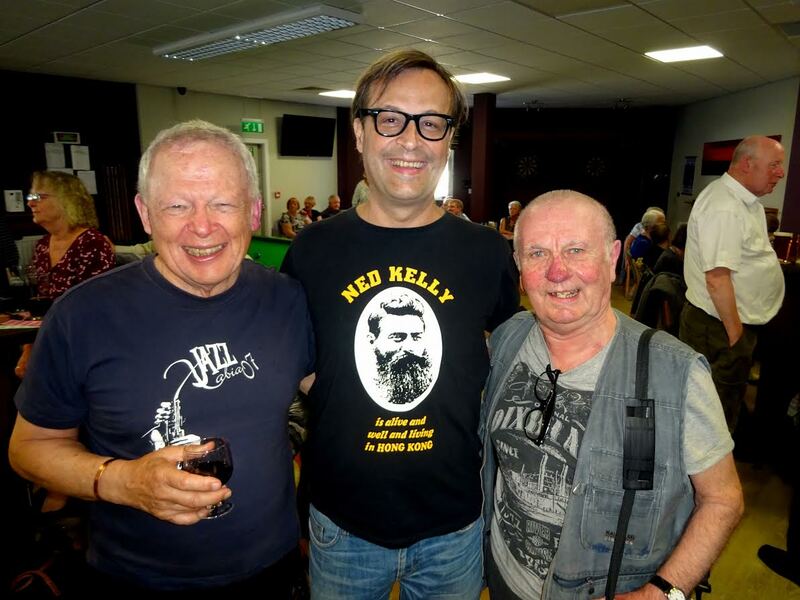 The annual visit by 'Our Man in Hong Kong' - ex-pat Colin Aitchison - and his Ned Kelly's escapees never fails to liven up the local scene. 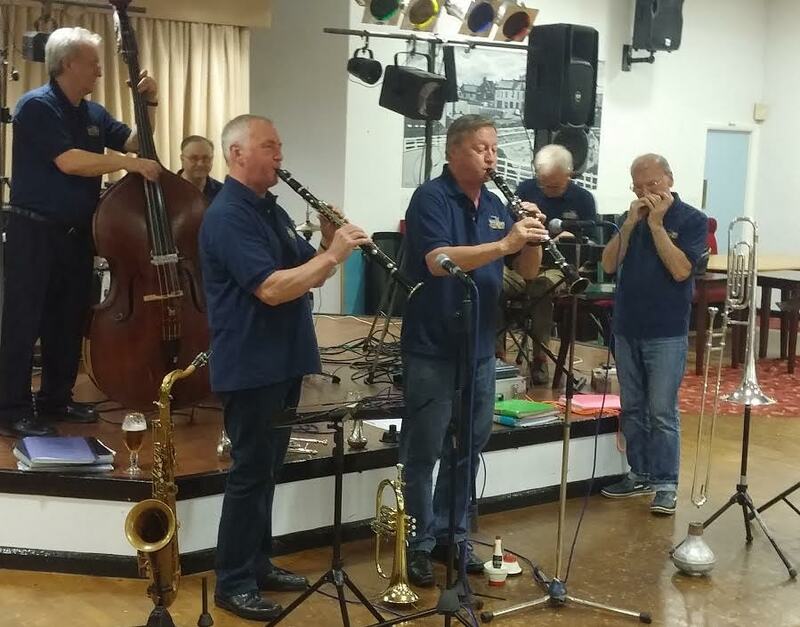 This afternoon, at the Crescent Club, Colin, Franco and Neville slotted into the Vieux Carré Jazzmen's line-up with ease making for a very enjoyable lunchtime session. The VCJ set the scene with I'm Beginning to See the Light, McBriarty, the younger, taking the vocal and blowing fine tenor. Bourbon Street Parade reminded me of the Breda Jazz Festival back in the 1980s when it seemed to be practically the Dutch national anthem. Bob Wade and McBriarty, the elder. shone. The Empty Shop’s satellite venue on North Road, Durham is a temporary affair as the bus station building is to be demolished in another major redevelopment in the city. Visual artists are tenants alongside other ‘creatives’ until such time as they’re given notice to quit. A makeshift performance space on the second floor (no stage, blacked-out windows) with a bottle bar and a warm welcome from Durham Brass Festival/Empty Shop staff, this the venue for Cutting Edge Brass. After a matter of seconds of the opening number, I knew that this was going to be one of those extra special gigs. Ace BSH snapper Ken Drew confirmed my initial enthusiasm at the conclusion of the first number. This was Skeltr’s inaugural gig in this country (their only previous gig being at a festival in Rotterdam) maybe their freshness contributed to the raw power and excitement of this dynamic duo. Further tension was created each time a new piece was triggered on the various electronic devices as no one knew what the exact outcome would be. Luckily everything seemed to work perfectly and the audience was treated to as an exhilarating and uplifting performance as I can remember. There will be two performances this weekend of Duke Ellington’s Sacred Concert by Sage Gateshead's youth ensembles Jambone and Quay Voices. For some of you, this may be a chance to recall the magnificent performances of this work by the late Stan Tracey and his Orchestra at Durham Cathedral in the early nineties. If you weren't able to be there then this is a rare occasion to hear this music revisited. If you were there, I'm sure you'll be interested in hearing it again. On Saturday afternoon at 1.00pm Jambone and Quay Voices will be performing this Concert under the leadership of Paul Edis, alongside solo vocalist Zoe Gilby and saxophonist Matt Anderson in the beautiful surroundings of Ushaw College. They will also perform this concert in Sage One on Sunday 16th July at 7pm.